Explore the engineering design process. Learn about engineers and their jobs. Practice teamwork and communication skills. Build a index card tower in response to a design challenge. Lesson adapted from the Engineering Adventures “Shake Things Up” curriculum from The Museum of Science, Boston. Talk about “to scale” distances with the group. Explain how we will use the receipt paper to label the planet distances from the sun (and each other). Give each group of students a pre-cut piece of measuring tape and the distance printout sheet. Each group should start by drawing the Sun at one end of the tape, then measure distances from there with the meter stick, marking each planet on the receipt paper. When finished, each group should have a “to scale” distance of the planets listed on their receipt paper. This activity helps demonstrate the immense scale of our solar system. 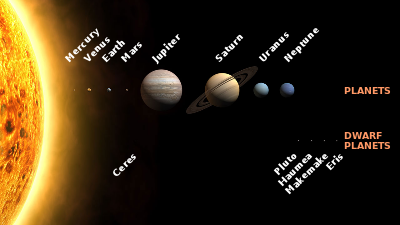 The sizes of the planets vary greatly as do the distances between planets and their distance from the Sun. Go over the pdf slides of jet propulsion with the group. Give each student a long balloon and describe how we will help them inflate the balloons. Go outside and line up students to start inflating the balloons–DO NOT LET THEM GO YET!! Once all balloons are filled, begin the rocket launch countdown. Everyone lets their balloon go at the same time, and watches to see where it lands (so they can pick up the balloon when finished). So how does it work? It’s all about the air…and thrust. As the air rushes out of the balloon, it creates a forward motion called THRUST. Thrust is a pushing force created by energy. In the balloon experiment, our thrust comes from the energy of the balloon forcing the air out. Different sizes and shapes of balloon will create more or less thrust. 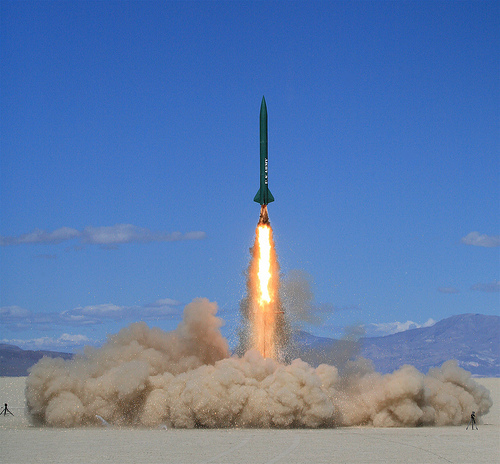 In a real rocket, thrust is created by the force of burning rocket fuel as it blasts from the rockets engine – as the engines blast down, the rocket goes up! Take a ball of clay and roll it in a ball and place it in the weigh boat (already on the scale). Place the clay in the weigh boat on the scale and read what the weight is. Use your planet gravity info to either add or take away clay based on the planet you are making. Continue on with a new ball of clay until you finish each planet. Compare the gravity-based sizes of the planets… how are they different compared to the actual size of the planets? Before we get into the subject of gravity and how it acts, it’s important to understand the difference between weight and mass. We often use the terms “mass” and “weight” interchangeably in our daily speech, but to an astronomer or a physicist they are completely different things. The mass of a body is a measure of how much matter it contains. An object with mass has a quality called inertia. If you shake an object like a stone in your hand, you would notice that it takes a push to get it moving, and another push to stop it again. If the stone is at rest, it wants to remain at rest. Once you’ve got it moving, it wants to stay moving. This quality or “sluggishness” of matter is its inertia. Mass is a measure of how much inertia an object displays. Weight is an entirely different thing. Every object in the universe with mass attracts every other object with mass. The amount of attraction depends on the size of the masses and how far apart they are. For everyday-sized objects, this gravitational pull is vanishingly small, but the pull between a very large object, like the Earth, and another object, like you, can be easily measured. How? All you have to do is stand on a scale! Scales measure the force of attraction between you and the Earth. This force of attraction between you and the Earth (or any other planet) is called your weight. If you are in a spaceship far between the stars and you put a scale underneath you, the scale would read zero. Your weight is zero. You are weightless. There is an anvil floating next to you. It’s also weightless. Are you or the anvil mass-less? Absolutely not. If you grabbed the anvil and tried to shake it, you would have to push it to get it going and pull it to get it to stop. It still has inertia, and hence mass, yet it has no weight. See the difference? Ahead of time, prepare the styrofoam balls by spray painting them so that one half is black, and the other half is glow-in-the-dark. Fold the card stock paper to create a stand for the pencil. Stick the pencil into the styrofoam “moon ball”, exactly on the line between the two colors. Stand the moon ball in the stand with the pencil so that is can rotate well without falling down. Use the bright light in the room to act as the sun, and see the different moon phases as you rotate the moon ball. The moon circles the Earth every 29 days. The Earth’s gravity pulls on it so that the same side of the moon is always facing us. 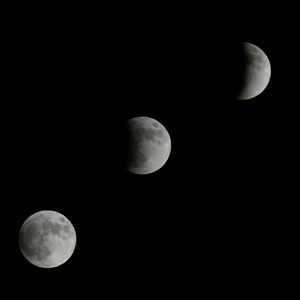 Nonetheless, we see a different view, or phase, of the moon each night of the month. Just like the Earth, half of the moon is always in sunlight, and half in shadow. When the moon is between us and the sun, the lighted part is pointed away from us, so we don’t see it — this is the new moon. As the moon orbits the Earth, each night we see a greater part of the lighted side, until the whole sunlit side faces us (full moon). As the orbit continues, we then see less of the lighted side until the whole cycle is completed and starts again. Stand on one side of the classroom with the telescope and try to read the word posted on the opposite side of the classroom on the poster board. To understand how a basic telescope makes faraway things look closer, think about why we can’t see distant objects using only our eyes. First, the tiny opening at the front of the eye (the pupil) does not let in enough light to give many details of a distant object. Second, an object that’s far away projects only a tiny picture onto the back of the eye. A telescope improves our vision in two steps. First, the big end of the telescope gathers a lot of light from the object you’re seeing. 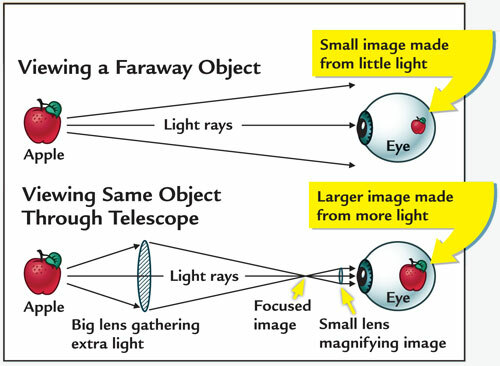 The lens in that end of the telescope focuses the light to make a small, bright image. Second, the small lens in the eye piece magnifies that small image, spreading it over a bigger area on the back of your eye. That way, you see a bigger image, including the details. Use your white crayon to draw 8 elliptical orbits around the center point (the Sun) on your black construction paper. Place each represented star/planet/asteroids in order on your paper. The Solar System is made up of all the planets that orbit our Sun. 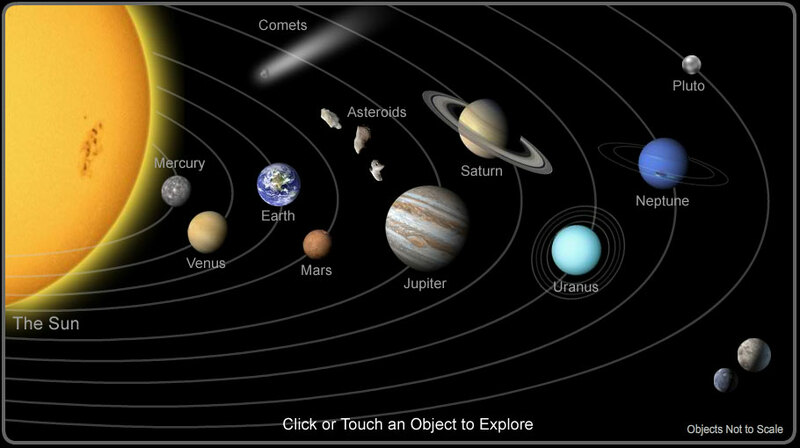 In addition to planets, the Solar System also consists of moons, comets, asteroids, minor planets, and dust and gas. Everything in the Solar System orbits or revolves around the Sun. The Sun contains around 98% of all the material in the Solar System. The larger an object is, the more gravity it has. Because the Sun is so large, its powerful gravity attracts all the other objects in the Solar System towards it. At the same time, these objects, which are moving very rapidly, try to fly away from the Sun, outward into the emptiness of outer space. The result of the planets trying to fly away, at the same time that the Sun is trying to pull them inward is that they become trapped half-way in between. Balanced between flying towards the Sun, and escaping into space, they spend eternity orbiting around their parent star. Explore how the landscape changes with different inputs. Explore the impact of earthquakes on society. Learn about the people who help prevent earthquake damage. 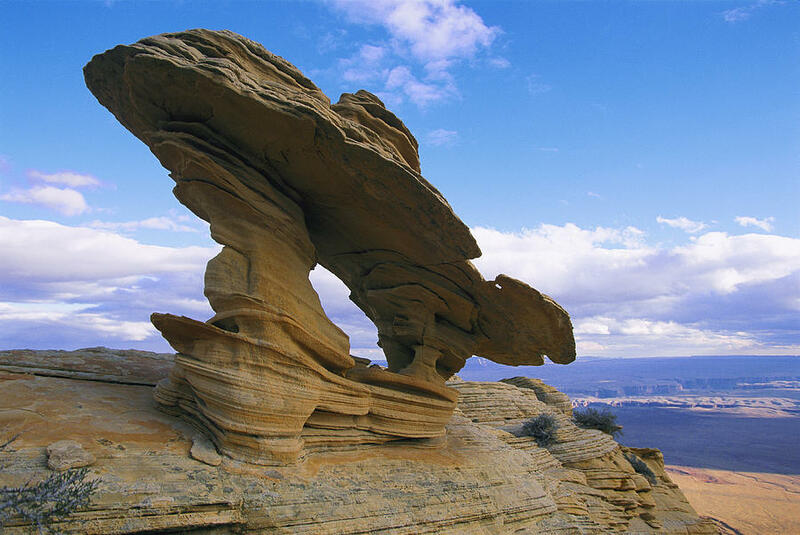 Build a shake table to model the waves formed in an earthquake. 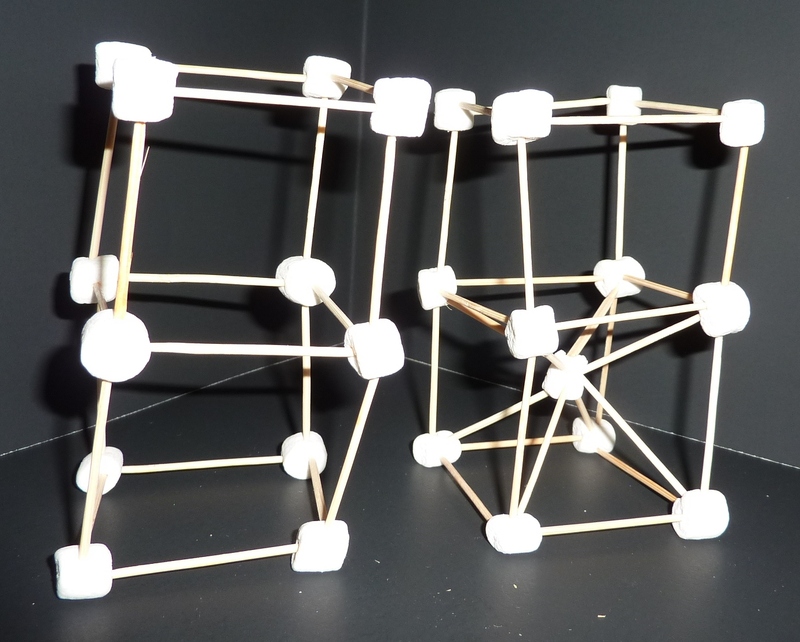 Use the engineering design process to build and improve earthquake resistant structures. Practice teamwork, planning, and budgeting skills. Explore different land and water forms. 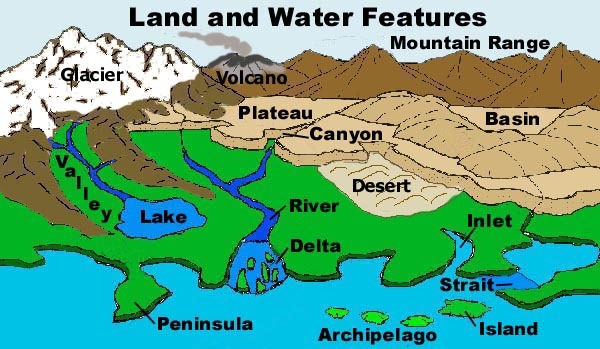 Learn about tectonic plates and geological activity. Practice project planning and diagramming. Build land and water features with frosting.